Student will examine the reasons fish are an important subject matter in Japanese Art. Student will create a Gyotaku print using similar methods to those of traditional Japanese prints. 1. Why are their so many underwater and fish pictures in Japanese art? 2. If I were a Japanese fisherman, what fish would I catch and make prints of? KWLH chart. Students will share what they know, would like to know, think they know, and hypothesize about Japan, fish, and printmaking. 1st Day: Student will examine the visual display of Gyotaku prints. Student will fill in the “What I already know ”and “What I think I know” sections of his/her KWLH chart. Student will answer the question “How do you think these pictures were made” in the “What I hypothesize section. Student will listen to the first half of the book Kogi's Mysterious Journey by Elizabeth Partridge. Student will fill further fill in the section “What I think I know” and create another hypothesis in their third column of his KWLH chart. The hypothesis should be an idea as to why fish are so important in Japanese art and culture based on reading the book. 2nd Day: Student will review previous knowledge about the use of fish in Japanese art from reading the book Kogi’s Mysterious Journey by Elizabeth Partridge. Student will listen to the second half of the book Kogi’s Mysterious Journey by Elizabeth Partridge. Student will listen to both a description of Gyotaku printing and watch a demonstration. Student will listen to an explanation of why fish are important to Japanese culture. Student will fill in “What I have learned” section further. Six students at a time will go to the red table and print their Gyotaku fish using ink and rubber fish model. Each student will bring an assistant to help them print. If he is not printing he can be a paint or sink helper. 3rd Day: Student will review the story Kogi’s Mysterious Journey by Elizabeth Partridge and the process/purpose of Gyotaku printing. Student will use oil pastels to color in the ocean and sky of their print. 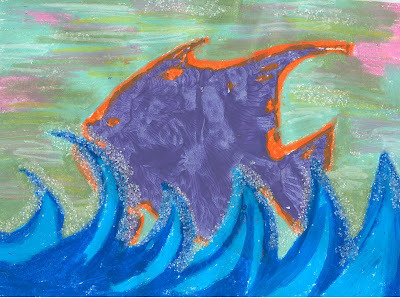 Student may add details of the fish with oil pastel. When student has completed coloring he may use a brush and glue to paint areas where he will add glitter. Who created these works of art- what job did they have and what was their nationality? What is the purpose of the Gyotaku prints? When did the Japanese begin making Gyotaku prints? Where did the Japanese fisherman make their prints? How would you record your catch of the day other than by printing? Why are fish so important in Japanese art and culture? Should we use real animals or animal parts in art projects? Remembering – What do Japanese fishermen use to make Gyotaku prints? Understanding- Why do Japanese fisherman make Gyotaku prints? Applying – If you were to record an object that you collect by printing it, what would it be? Analyzing- Gyotaku prints are simple stamps of fish on white paper. As an artist what background and foreground elements would you add to make the print a narrative? Evaluating- Gyotaku prints are meant to be useful, can they still be art? Creating- As an artist how can you take a simple Gyotaku print and make it more visually dynamic? Fluency- How many uses can prints have? What would you print that may be useful? Flexibility- How would you feel if you were a Buddhist monk that is a vegetarian and you were looking at this art? Would your beliefs allow you to accept the art or would you be against it for using a dead animal? Involvement- How would you feel if you were the fish being used to make this art? Reorganization (Provocative)- Since Japan is an Island surrounded by water, fish is a main source of food. If Japan were not an island, what type of land would it be? (arctic, desert, jungle) Based on your answer what animals and other ingredients from the land might they use to make food? 4th Day: Student will share his Gyotaku print with the class in a critique. · Indicate the different ways you will use these questioning strategies to differentiate instruction. Several of the questions asked pertain to science and naturalist ways of thinking with regards to whether or not it is acceptable to use fish (and other animals) in art. Some of my questions are completely literal and rely on the students listening and reading skills. There are quite a few that ask the student what they would feel as a fish or a vegetarian and they are intrapersonal. Other intrapersonal questions have to do with what the student would collect and print other than fish. There is also an organizational/mathematical element in terms of using these prints to record and that is discussed in the questions. Only two questions rely on visual/spatial learning in terms of make the prints more visually dynamic and stylized.